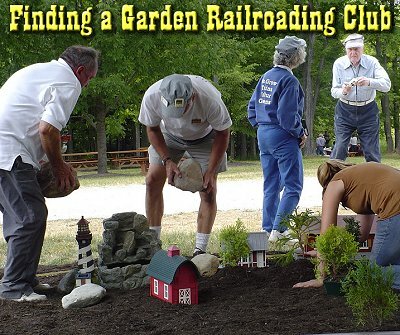 For years I have advised beginning garden railroaders to try to find a local or regional club. Club member share tips, plant starts, and fellowship. Often a good club is the difference between getting your own railroad off to a good start or engineering one disaster after another. Most clubs do a great job of welcoming, educating, and otherwise helping newcomers to the hobby. But sometimes a good club is hard to find, literally. Many model railroading and garden railroading resources try to keep an updated list, but those lists only work as long as club members remember to call them with changes. And, sadly, many clubs have problems remembering to update those lists, or even to keep information updated on their own web sites. So, while this may look like a list of active clubs, it is really just a list of clubs that were active the last time I had anything to do with them. I have checked the web sites to make certain that the links worked, and I have begun e-mailing the contact people for the clubs without listed web sites to be certain I still have the right contact names. But even if I have this list 100% up to date tonight, it will be out of date by the end of the month. So think of this as a starting point on your quest to find likeminded hobbyists close to you. If you are associated with any of these clubs, please let me know, and also tell me if any information needs to change. If your club is not listed here, please contact us with your information. Also, if a link breaks, or you have reason to believe that a club listed here is no longer functioning as a club, let me know that as well. LGB & G-Scale Model Railway Club of Australia Based in Sydney, has members from all over Oz and NZ www.trainweb.org/lgbofozclub See web site. Rocky Mountain Garden Railroaders Calgary www.rmgr.org See web site. Northern Alberta Garden Railroaders www.nagrs.ca/ See web site. Backyard Railroaders Newmarket www.backyardrailroaders.com See web site. Central Ontario Garden Railroad Association Mississauga http://cogra.org/home.html See web site. Chatham Kent Garden Railway Society Chatham www.ckgrs.com See web site. Club der LGB Freunde Rhein/ Sieg e.v. In the Rhein/Sieg area in the Cologne region www.lgb-rheinsieg.de/de See web site. The G Scale Society Includes members and smaller groups from many regions www.g-scale-society.co.uk/ Web site has many interesting features - worth a visit even if you're an ocean away. Includes links to local groups. East Midlands G Scale Society East Midlands and beyond http://gscaleeastmids.co.uk/ Club is active, but web site is still under development. Check out the Archive Section to see past newsletters. G Scale Society - Northwest Area Group Manchester & environs http://g-scale-northwest.co.uk Includes member gallery. Arizona Garden Railway Society azmodelrr.com See web site. Gold Coast Garden Railway Society Ventura http://gcgrs.com/ See web site. Greater Humboldt Bay Garden Railway Society Eureka www.ghbgrs.org See web site. Sacramento Valley Garden Railway Society Sacramento and 50-150 miles in each direction www.svgrs.org/ I know some great people in this club. Santa Clarita Valley Garden Railroad Club Los Angeles County www.scvgardenrr.com See web site. Shasta Garden Railroad Society Redding www.shastagrs.com See web site. Upland Garden Railway Society Upland www.uplandgrs.org See web site. Del Oro Pacific Modular Rr Rocky Mtn Div www.deloropacific.org See web site. Denver Garden Railway Society Greater Denver www.denvergrs.org See web site. Northern Colorado Garden Railroaders Fort Collins clubs.mylargescale.com/ncgr See web site. Emerald Coast Garden Railway Club Pensacola www.ecgrc.com See web site. Georgia Garden Railway Society ggrs.info/ See web site. Vines Garden Railroad Club, Inc. Loganville www.vinesgardenrailroad.com See web site. LGB Model Railroad Club of Chicago Greater Chicago lgbmrrcc.com/ See web site. Chicago Area Garden Railway Society Greater Chicago www.cagrs.com See web site. Midwest RAILS Greater Chicago www.midwestrails.org/index.html Mostly focuses on modular railroads. See web site. Central Iowa Garden Railway Society Osceola and environs www.trainweb.org/cigrs/ See web site. Cedar Valley Garden Railway Society Cedar Rapids and environs www.cedarvalleygrs.com/ See web site. Kansas City Garden Railway Society, Inc. Kansas City www.kcgrs.com See web site. Wichita Area Garden Railroad Society Greater Wichita www.wagrs.net See web site. Maine Garden Railway Society Where is Weld, anyway? Has members from almost all over the state. http://mgrsmembers.blogspot.com See web site. Mason-Dixon Large Scale Railroad Society, Inc. Bel Air mdlsrs.com See web site. Washington, Virginia, & Maryland Garden Railway Society Gaithersburg MD www.wvmgrs.org Web site has "how-to" articles. Ozark Garden Railway Society Springfield and environs http://ogrs.org See web site. Long Island Garden Railway Society, Inc. N. Massapequa www.ligrs.org Small photo gallery. I know some especially helpful people in this club. Miami Valley Garden Railway Society Greater Dayton www.mvgrs.com Very friendly and active, with some very talented members. Members' photo gallery, members-only newsletter archive. Columbus (Ohio) Garden Railway Society Central Ohio www.cgrs.org A large and active club with many helpful and experienced members. Several remarkable railroads that I've seen in person. Greater Cincinnati Garden Railway Society Greater Cincinnati www.gcgrs.org One of the largest and most active clubs in the country, many railroades influenced by Paul Busse who is based here. Members' photo gallery, members-only newsletter archive. Northern Ohio Garden Railway Society NE Ohio www.nogrs.org I have met and worked on projects with several members of this club - very helpful people, though quite spread out. www.facebook.com/riversiderailroad Located at the S.C.O.P.E. center at 220 West Market Street, Warren, OH 44481. We meet on Tuesdays at 5 and usually have three open houses a year. Central Oklahoma Garden Railway Society Oklahoma City environs A Facebook Page is supposed to be starting. Tulsa Garden Railroad Club Greater Tulsa www.tulsagardenrailroadclub.org See web site. Southwest Oregon Large Scale Trains Central Point www.solst.com Maintains a permanent railroad in a public park. Pacific Crossings Model Railroad Club Salem http://pcmrc.com Hosts occasional open railroad tours. Web page has some clever articles. Crossville G Scalers Crossville www.crossvillemrc.com See web site. Mid-South Garden Railway Society Collierville www.msgrs.org See web site. Garden Railroad Club of South Texas Needville gardenrailroadclub.org See web site. Heart-Of-Texas G-Gaugers Austin www.hotgg.org See web site. or e-mail HAGGPrez99@aol.com See web site. Utah Garden Railway Society Northern/Central Utah www.ugrs.org See web site. Vermont Garden Railway Society www.vtgrs.org See web site. Tidewater Big Train Operators Virginia Beach www.tbto.org See web site. Puget Sound Garden Railway Society Puget Sound region www.psgrs.org See web site. Shenandoah & Potomac Valley Garden Railway Club www.spvgrc.org/ See web site. Wisconsin Garden Railway Society Sun Prairie www.wgrsociety.org See web site. Some other folks have been collecting club information for much longer than me, and they may have listings that I haven't tracked down yet, or that I didn't include because I couldn't get any verification for them. If you have a reasonably updated database of garden railroading clubs, please let me know and I'll check it out for possible inclusion here. Also, if you're searching for a club, and you find a good club near you that I don't have good information for, please let me know, and I'll update my list above. 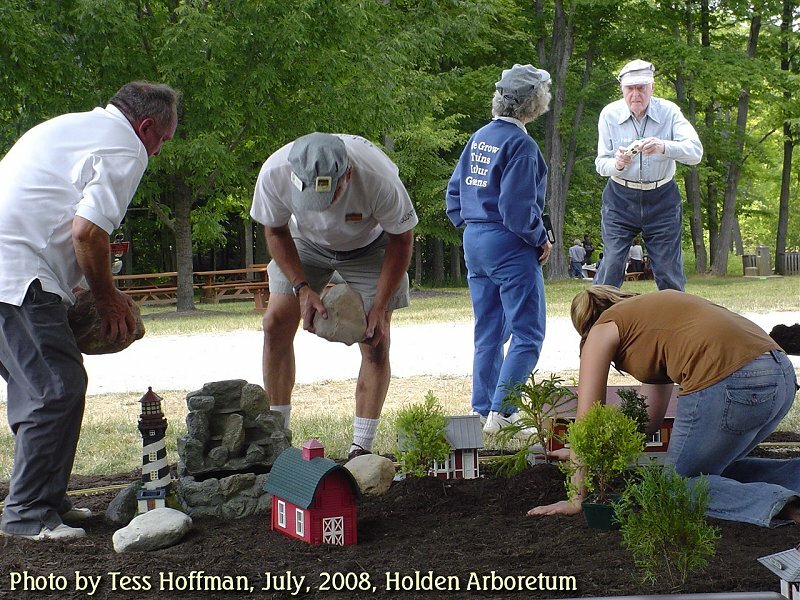 GardenTrains.org club database - This database is searchable by zip code or state name. It includes clubs outside the US. Trains.Com's club database - This lists clubs alphabetically by club name, but it can be searched alphabetically by city name as well. Large Scale Online's club database - This list is searchable by club name or state.